On my last morning at Somerset House, the lovely Lucy of Snippets of Shiny Thoughts asked me to sum up London Fashion Week in a few words. Well, Lucy, here is your answer - LFW is exhilarating, theatrical and an experience akin to jumping into a plungepool of effervescent visual moments, styles and people. Above are three photos taken from different sites, all of the outfit I wore on my first day (Saturday) at London Fashion Week. (Take a look at Style East for another fabulous version too). It's been an exciting few days, and now that I'm back home the fun continues with seeing shots of my outfits on websites and blogs that I respect and admire. The weather was frightfully foul peppered with energetic drizzling (is that an oxymoron? ), but this didn't stop it being a wonderful day to be inducted into the whole process of LFW. From seeing my first ever show (Louise Amstrup, but more on that later) to meeting a whole host of wonderful bloggers and experiencing street style photographers who were in the majority unfailingly courteous and creative. I got very used to repeating the description of what I was wearing, so here for the record, this outfit is made up of: a vintage leather coat from a market stall (Christmas present from my mum), a suede miniskirt (topshop) from ebay, men's Marks & Spencers brogues from a charity shop and a bag bought at a charity shop stall at the Big Chill festival. The polo neck is thrifted, the gloves are vintage (grandma's) and the cross pendant belonged to my great grandma. I'd like to send out special thanks to the ever-incredible Jill (pictured above). 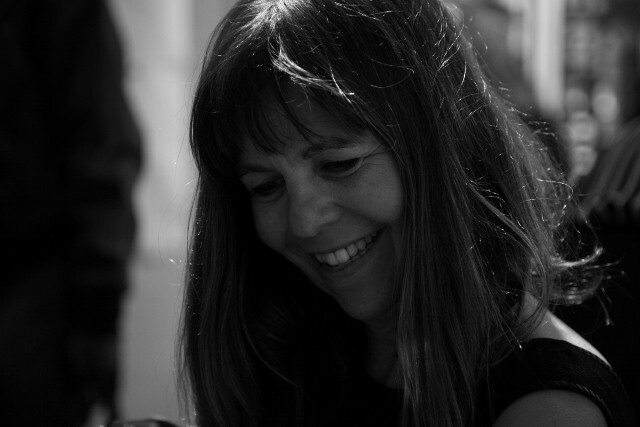 LFW would have been a very different place and experience if it hadn't been for her - from advising with press passes, to a pivotal role in involving my mum and me in being invited to a private viewing of the current SS2011 Jaeger collection. Along with the Jaeger experience (which deserves a post of its own - coming shortly), other highlights included attending the Mulberry after-party, courtesy of a really kind friend, plus briefly meeting Erin O'Connor the next day. She is truly the epitome of British charm and grace. In the flesh, her poise is just breathtaking. If there's anyone who knows Erin, please tell her that even in a fleeting encounter, her generous spirit is obvious! I also really enjoyed attending the Osman (thank you Tanya! ), Louisa Amstrup, Masha Ma and Todd Lynn (thank you Nao!) shows. I'd like to write a better analysis of the clothes I saw once I have sorted out all my photos, but I can safely say that it looks like structural garments will be very popular come autumn. There was a real sense of quality with these garments, with obvious craftsmanship and attention to detail. Thanks Style East for the photo! Finally, I really enjoyed meeting Style East (link above), Bip, Dvora, Lucy, Carrie, Frances, David, Daniela, and sadly although I didn't see Carly, she apparently saw me and my mum! Also, special thanks to the lovely Ling family for their unfailing kindness. Finally, to the young woman in the gold jacket after the Louise Amstrup show, who came up to say she really liked my blog - big thanks to you, as well as the others who took the time to say hello too. Oh, I saw these photos of you on the various websites and my heart fluttered a bit. You look so fantastic, and both you and jill and so beautiful. And meeting Erin O'Connor? What an experience! See, you look undeniably chic in foul weather, very few girls master that as well as you do. Wow, you did a lot didn't you, glad you had fun! No wonder your outfit is popping up everywhere, it's beyond lovely! From the leopard print gloves to the effortlessly cool brogues, your outfit sums up vintage cool! Your coat is stunning, and that bag was just THE perfect companion for it! This may sound stupid,but how did you actually get in to the shows/after parties.I thought they were not open to the public? did you stay in london for the whole week? If you have any spare time,I'd love for you to answer. Wow Roz, how fantastic that you were snapped by so many admirable bloggers! You deserve it though as your outfits are so wonderful. So jealous of your Jaeger preview! Glad you enjoyed it so much and looking forward to seeing your Jaeger post! Love that first coat! I wish I could have gone to the Fashion Week in NYC but I was too late. I am so glad that you are getting all the attention you deserve my dear Roz. There were hard times in your life, so now, it is the moment to enjoy the sweetness of the good ones. fantastic! i saw the pic too and thought you looked absolutely amazing! That coat is really fabulous! Those pictures are so stunning! gorgeous outfit! what an amazing coat! no wonder you got snapped three times! great to hear you had such a great time! lucky you! and you luck amazing! I looooove your coat! You look absolutely stunning in all of the shots. It's so nice to hear about a nice, down to earth girl is going to fashion week. Your style is extremely recognizable because you mix old fashion with contemporary clothing very well. Glad to hear you had a good time! You look STUNNING! One of the most gorgeous young ladies to grace this earth with her presence and talent! GAH! I loved seeing you popping up on my fave streetstyle blogs. you go girl! 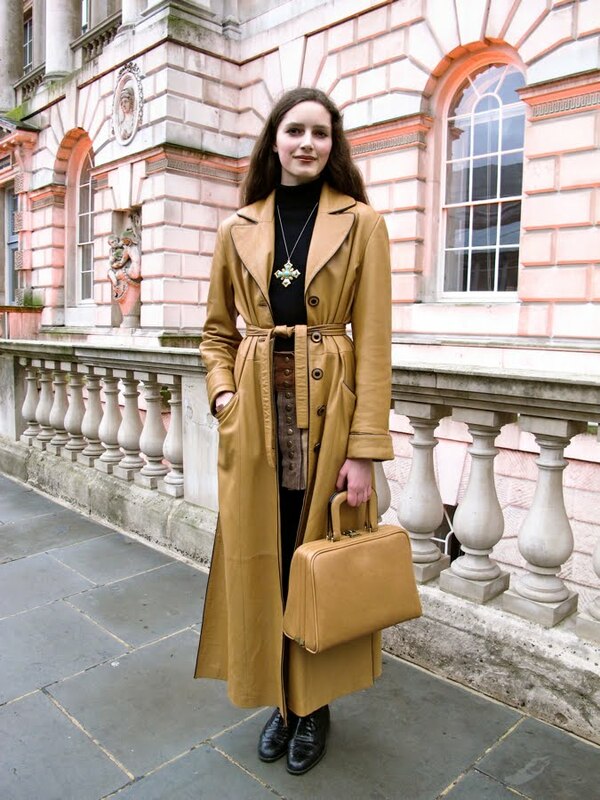 love your camel leather coat and matching bag. glad you had fun at LFW, the rainy streets/building in the background of the first photo really sets the mood--beautiful! Great photos. Looks like you are having so much fun. wow! You look great. The outfit is just so stylish! I LOVE it!!!!! I am obsessed with that outfit. Men's shoes! Brilliant! Do they fit? I can't imagine finding a pair that would fit my feet. They look phenomenal, as does the rest of the outfit. Awe, Roz! It's so cool to see you out there in the streets of London posing so happy! :D And, wow, that picture of Jill is just awesome! you've got a great collection of shots here. I love this post! I always look forward to your new posts, your pictures are so inspireing! well.u looks so stunning and fabulous .. This coat is amazing. And so are your pictures ! Thank you Roz! What a wonderful quote, thats surely the best all week :) will pop it in my next post! Amazing that you've been pictured on so many peoples blogs! Your so lucky! I love Somerset House, it's a pity the weather was so bad, but thats London for you! Wish I could have been at London Fashion Week! Congratulations on your trip to LFW, and on your street style features! I love the contrast of simple slick minimalism in the long coat and bag, with the burnished skirt, the big jeweled cross, and the animal print gloves. I *love* that first outfit, Roz, dear! You are a true model-worthy girl. I'm in Waterloo per se but unfortunately missed LFW. Thanks for the mention Roz, I feel terrible not coming over to say hello but it was so hectic being the morning of the show and the running order was causing me so much stress it was probably a good idea that I didn't introduce myself to anyone. What did you think of the collection? I'm so glad that you and your mum had a lovely time in London, it's great that you're getting to see all of these collections and meet lots of amazing people. You look absolutely stunning in the photos, I especially love you in the picture with Erin, your blushed cheeks and lipstick are so beautiful. Fingers crossed next season I will get to meet the super talented Roz. aaaa I just put the picture I took of you at the fashion week, on my blog, but you arlready put the others ones !! any way, I was glad to see you in real !! Of course you'd be snapped in all the streetstyle blogs- I love it! I feel like I must gallop off and check them all out. LOVE LOVE LOVE your pic of Polka Dot. I always enjoy seeing her face, and wish she'd post more of herself on her blog, but this one will do! So glad to hear you loved your first LFW. I eagarly await the following installment. Aw, Roz... I don't know what to say. You're away and hope you're all having a lovely time & we'll talk when you're back but thank you - and what a fabulous post. Yes that sums up the fashion week experience exactly: jumping into a plunge pool of.. what was it, effervescence? It's so true. Such a creatively inspiring experience. It's different than mine... the composition reminds me of one of those early Renaissance Italian paintings, where the background is like a little 3D box.. you know what I mean? I think i spied you at LFW last weekend! Glad to hear you enjoyed fashion week. Sound like you had an incredible experience!! I cant wait to move to London, I will then get to go to fashion week finally! You are so lucky you got to go this year! That coat is soooo pretty, glad you were noticed! with that outfit you totally deserve to be on facehunter and stockholm streetstyle!